At Marin Day Schools EDS programs children participate in extracurricular experiences that include art, science and nature, language and social development, computer literacy, dramatic play, games and sports, math, music and movement, special events and homework support. The curriculum is based on Bright Horizons' World at Their Fingertips, a program that empowers children to become confident, successful, life-long learners and secure, caring people. EDS uses both a project- and theme-based approach to extended learning. They create opportunities for children to make friends and spend time with them in different settings, from classroom to playground and neighborhood walks. 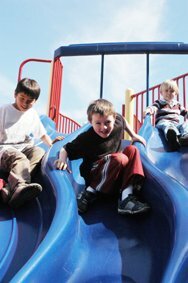 State licensed centers are located on site at each of the five public elementary schools in Mill Valley. EDS considers it a privilege to accompany Mill Valley children as they grow and learn. Centers are open from 7:30 a.m. to 6:30 p.m. every school day. Special camp programs are also offered on most holidays and school recesses. EDS websites are www.marindayschools.org and www.brighthorizons.com/edstamvalley. Contact information is 415-388-8304 phone and tamvalley@brighthorizons.com The Tam Valley State site facility license is #213005259. Supervised playground, also called Tia's, is available until 6:00 p.m. daily through the Tam Community Services District. The price is extremely reasonable but please note that the student to adult supervision ratio is quite high, making this program most appropriate for students older than first grade. Registration forms are available from Tia Smirnoff in Room 29. To reach Tia's please call (415) 388-9931. The school district provides supervision for students before school, 7:45-8:15 am. We ask that you not drop off students before that time.